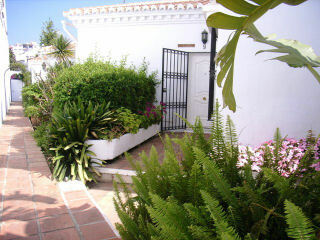 A three bedroom terraced Villa in a great position overlooking Burriana beach and walking distance to all amenities. The property comprises, on entrance a double bedroom with fitted wardrobes, a twin bedroom with fitted wardrobes, a full bathroom and stairs leading up to a private roof terrace with fantastic views. There is also another staircase down to the lounge, with french doors to a south facing terrace. Also on this level is the kitchen, a small back patio, a bedroom with bunk beds this having ensuite shower room. 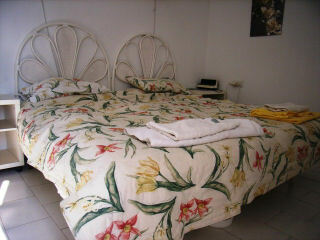 The property is older in style but has all you would need for a comfortable holiday close to all Nerja has to offer. The furniture a little rustic but there are plenty of modern conveniences eg. kettle, iron, microwave etc. There is also a community swimming pool normally open May until October, we can't be responsible if community pools have to close for maintenance etc. The community is gated and you reach the property along pathways lined with flowers, a well looked after and safe place to stay. Burriana beach is the main beach in Nerja and it is approx. 300 metres away, there you can find many bars, restaurants and water sports etc.